WorldClassRoom FAQs - Why can't I see my course when I log in? 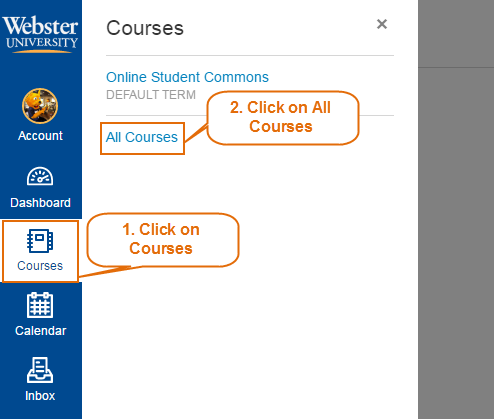 Why can't I see my course when I log in? Have students been loaded in the course yet? Students are loaded into WorldClassRoom courses the weekend before the official start date of the term. In other words, your course will appear in your WorldClassRoom course list the Friday before the term starts by Noon central time. Check the Academic Calendar for the term start date, noting that the date will differ based on the duration (semester, 8-week, or 9-week) of the course. If students have not been loaded in the course, please check your course list again the weekend before the term starts. If students have been loaded in the course, go to step 2. Is the course hidden in your Courses list? 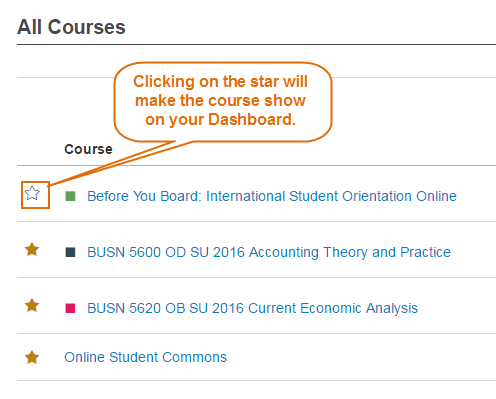 Depending on your settings, some of your courses may not appear in the main Courses list. 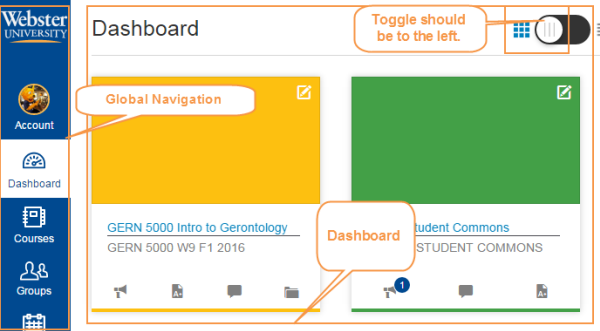 Check your Dashboard, click on Dashboard from the Global Navigation. Click the Courses link from Global Navigation, then click on the All Courses link. Check the All Courses list for the course. If the course is not in your full All Courses list, proceed to step 3. Verify that you are officially enrolled in the course. To check your schedule online, go to Connections > Student Academic Services > Student Schedule, make sure you Current Option Settings are set to the current term. You may also contact Academic Advising during regular business hours for questions about your schedule. Has your enrollment changed in the last 24 hours? If you have added, dropped, re-enrolled, or withdrawn from a course, it will take up to 24 hours for those changes to take effect in WorldClassRoom. If such a change has occurred, please wait 24 hours and check your Dashboard or All Courses list again. If, after attempting steps 1-4, you still cannot see the course in WorldClassRoom contact the IT Services Desk immediately to resolve the problem.